I guess my elation at the lamb shanks my mum-in-law gave us must have been very obvious because we received a second package of lamb shanks not too long ago. Yay! Ok, I might have been a bit sheepish, wondering if she thought I was hinting around for a second serving (I swear up, down, and round and round that I wasn’t! )…but I was shamelessly thrilled nonetheless. The first batch of shanks she gave us I made into Lamb Youvetsi, a hearty Greek dish which remains one of my staunch favorites. 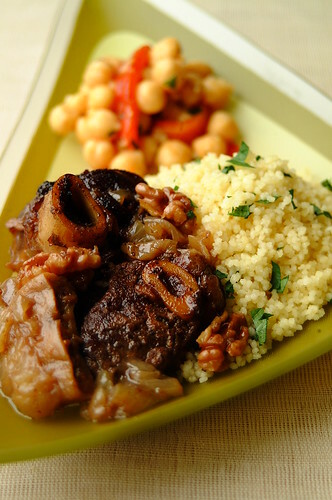 For this batch, I wanted to move south to Morocco, famous for its tagines, those aromatic stews smelling of cinnamon and scattered with dried fruit and nuts. Despite having a book on Arab cooking (filled with luscious-sounding recipes I hope to share here someday) I ended up settling on a recipe from Alastair Hendy in The Accidental Foodie. With figs and walnuts among the ingredients, I was absolutely sold. Much as I did here, I decided to substitute the dried spices with my Egyptian baharat. Baharat is an Arabic spice blend, of which there are many different varieties depending on the country of origin. I know I have totally crossed borders here, but I figured that since Morocco and Egypt are both in Northern Africa I wasn’t straying that far off course. – Heat oil in a wide casserole and brown lamb all over, adding salt and pepper. – Remove from the heat and take lamb out of the pot. Line the bottom of the pot with the onion slices, then place lamb back in, over the onions. – Sprinkle baharat over everything. Tuck the orange rind and cinnamon sticks around the lamb. – Pour water in, just enough so the meat sits in a shallow puddle. Season again and return to the hob. Allow to boil, and then transfer immediately to an 180C oven and leave it to slowly braise for about 2 1/2 – 3 hours (until meat is very tender). – Halfway through cooking, check the water level to make sure it hasn’t dried up. At this point check seasoning and adjust as needed. Add figs and nuts during the last hour. I made some couscous, tossed with chopped parsley, to go with it. I also made a salad of chickpeas and roasted peppers, a simplified version of this one (I didn’t add the goat’s cheese since I didn’t have any on hand). Right now everything is resting in the kitchen (Alastair did advise to make it in advance as the flavors “get happier as the get to know each other”) waiting for dinner. I must admit though, I did take a tiny taste! I couldn’t help it…the fragrance wafting up from the casserole was just too good to resist. I know this sounds painfully obvious, but it tastes just like it smells! One minute you are entranced by this delicious aroma, the next it is exploding in your mouth…each scent with its corresponding taste, and you find yourself trying to match each scent with a particular spice. But it’s difficult as the baharat is a mysterious blend and there are nuances that are teasing and taunting and keeping themselves hidden. All this is touched by the sticky sweetness of the figs. The lamb is falling of the bone tender, and whole thing is rich and unctuous. This is just the thing to have now that it’s gloomy and wet outside…and just the thing to comfort me after getting soaked in the rain yesterday…I must remember to keep my umbrella handy these days! ***If you’d like to try the original, Mr. Hendy uses 1 teaspoon each ground ginger, cinnamon, coriander and cumin (instead of the baharat) for 1 kilo of lamb or 4 lamb shanks. You can also use lamb stock instead of water if you have it.